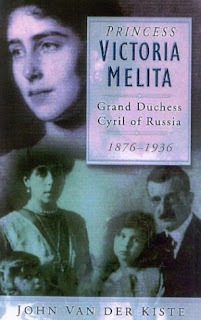 Princess Victoria Melita: Grand Duchess Cyril of Russia 1876-1936 is a 2004 biography on Princess Victoria Melita of Saxe-Coburg and Gotha, Grand Duchess of Hesse and by the Rhine and then later Grand Duchess Cyril of Russia by John Van der Kiste. Born on November 25, 1876, Victoria Melita was the second daughter of Alfred, Duke of Edinburgh, second son of Queen Victoria and Prince Albert, and Grand Duchess Maria Alexandrovna of Russia, only daughter of Tsar Alexander II of Russia and Marie of Hesse and by the Rhine. She was named Victoria after her grandmother and Melita because she was born in Malta. In the family she was known as "Ducky". Only a year younger than her elder sister, Marie "Missy", many mistook Victoria Melita to be elder of the pair because she was taller and more serious of the two. Both sisters were opposites in both appearance and personality. Marie was blonde and care free while Victoria was dark haired and broody. Both remain devoted to each other for the rest of their lives. Victoria Melita's parents marriage was unhappy, the only happiness in Maria Alexandrovna's life was children. She was a strict parent who raised her children with an iron fist but it was apparent to all that they were the joy of her life. In 1889, the family moved to Coburg where Alfred was heir to his childless uncle, Ernest, (he would eventually succeed in 1893). Maria Alexandrovna, who blamed all her woes in her marriage on Great Britain, became a complete Germanophile and forced her beliefs on her daughters. None of her daughters appreciated it. Maria Alexandrovna decided to marry her daughters off while they were young before they could "properly think". After marrying Missy off to Crown Prince Ferdinand of Romania, it was decided the Ducky should marry her first cousin, Grand Duke Ernest of Hesse and by the Rhine. The marriage started off harmoniously and the couple managed to produce a daughter, named Elisabeth. The couple threw magnificent parties and their household was the considered the merriest house in Europe. But it was all a facade. Ducky and Ernest fought continuously about her inattention to duty and his lack of affection., the fights often becoming violent in nature. The couple did try to rekindle the earlier happiness of their marriage but the result was only a stillborn son. Queen Victoria felt bad for the unhappiness of the couple but refused to grant them a divorce for Elisabeth's sake. The old Queen's death in 1901 but an end to any opposition to the divorce. Elisabeth, who was devoted to her Father, had a dislike of her Mother saying, "Mama says she loves me, but you [Ernest] do love me". Elisabeth's death in 1903 severed any link between Hesse and Victoria Melita. Ducky had first met Grand Duke Cyril Vladimirovna of Russia in 1891 while attending the funeral of Grand Duchess Alexandra Georgievna of Russia. It was there that they fell in love and after her divorce, she began visiting him regularly. His parents disapproved of the whole affair and Grand Duchess Maria Pavlovna told her son to end it. In 1904, during the Russo-Japanese war, Cyril was on active service when his ship was blown up at Port Arthur. He was one of the few survivors and the experience made him more determined than ever to have Ducky. Against the expressed wishes of the Tsar, whose wife, Alexandra, was the sister of the Grand Duke of Hesse, he married Victoria Melita on October 8, 1905. Cyril subsequently lost his place in the succession and his rights and property in Russia. Their two daughters, Maria and Kira, were born during their exile in France. Nicholas II was eventually forced to reinstate Cyril in the line of succession, who became third in line for the throne upon his return in 1910. Ducky was now Grand Duchess Victoria Feodorovna of Russia. Ducky held great parties in St. Petersburg and eventually formed a rival court to that of the Tsarina. When the first World War broke out in 1914, Victoria Feodorovna worked as a nurse for the Red Cross. As the war began to turn south for Russia, Ducky joined a movement to have the Tsarina dealt with and to save the monarchy. It was too late; the Russian Revolution broke out in 1917 and a year later Tsar, his wife and five children were murdered at Ekaterinburg. The then pregnant Victoria Feodorovna fled with her family abroad - escaping that terrible fate. Grand Duke Vladimir Kirillovich of Russia was born on August 30, 1917, while his family was staying in Finland. The family of five would have difficulty finding a home for the next decade. In 1923, Cyril suffered a mental breakdown. To get him out of his stupor, Victoria supported him in claim for the Russian throne, it was met with a cold reception by the rest of the Romanov family. Still, the couple remained devoted to each other and were happy in their family unit. Then in 1933, Ducky discovered that Cyril had had an affair while in Paris. She was heartbroken and never forgave him for it. Victoria Melita died in 1936 after suffering her stroke. While her husband had been unfaithful, he was devastated by her loss. He died only 2 years later. I give this book a 2/5. This book was not one of John van der Kiste's best. The book hardly touches on Ernie's alleged homosexuality and it marginalizes little Ella (which might actually be how Victoria Melita truly did feel about her daughter from her first marriage). I can't say much to this book whether for or against it. All in all, rather dull and plain, something hardly worth noticing.